Art imitates art imitates art. How can you not like a film that begins and ends with a roaring gunfight, particularly when the film owes its allegiance to Sam Peckinpah’s “The Wild Bunch” and afterwards encouraged Quinten Tarantino’s “Reservoir Dogs”? I’m reminded in this regard of Akira Kurosawa’s “The Seven Samurai,” which the director said was inspired by old Hollywood Westerns and which, in turn, kindled “The Magnificent Seven.” And so the cycle of filmmaking goes on, art motivating art. “City on Fire” is notable for a number of very good reasons and several fairly serious bad ones. It’s a 1987 Hong Kong action feature ably directed by Ringo Lam from his own original story. As such, it’s one of the best of the breed. It stars the always-capable Chow Yun-Fat (“Crouching Tiger, Hidden Dragon,” “The Replacement Killers”) in a memorable performance. It boasts a good costarring performance from Danny Lee. And it’s got slam-bang action from the word “go.” On the other hand, it exposes several weak supporting performances, a whole slew of crime-movie clichés, some troublesome English dubbing, one of the most-annoying rock-music scores ever composed, and an absence of almost any bonus materials whatsoever on the DVD. Certainly, it’s a movie worth watching, but be prepared for hardships. Chow Yun-Fat stars as a young (and, my, how youthful he looks here, just a little over a dozen years ago) undercover cop named Ko Chow who’s working to topple a gang of murdering jewel thieves. The deal is that no one, not even fellow police officers, knows he’s working undercover. His boss, an aging Inspector played by Sun Yeuh, is the only person who knows he’s a good guy and not one of the baddies. So Chow is in the unenviable position of having both the crooks and the police suspicious of him. Chow’s job is to infiltrate the gang and get the goods on them. He does so, and in the process he meets and befriends one of the gang members, convincingly played by Danny Lee. This friendship adds an element of internal conflict to the story as Chow’s loyalties become divided by his newfound bonding. Just exactly why Chow should take a liking to a bad guy who has murdered one of his fellow policemen in cold blood is never explained. The movie plays like an old-fashioned Hollywood gangster film. One can almost see Jimmy Cagney in the starring role. Chow’s a reluctant hero, to his credit not a superman. In fact, he doesn’t even want the job but is coerced into doing it. What he does beyond his occasional law enforcement work is questionable, however. He appears to be something of a rebel himself, a rather carefree and careless young man with no visible means of support outside his apparently temporary undercover assignment. As the young man, Chow Yun-Fat plays him as alternately happy-go-lucky and grimly determined. At all times he seems quite vulnerable, a man easily hurt and easy to hurt. Lam’s direction is topnotch. The gun battles alone are worth the price of the disc. 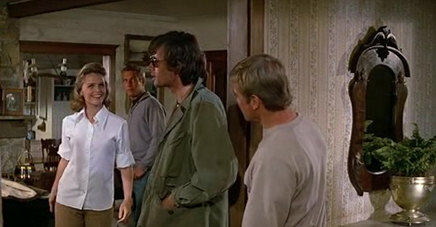 But be aware that like Chow’s character, the film itself alternates between scenes of comic misadventure and scenes of extremely realistic brutality. During the first robbery, for instance, the robbers are so dumb one of them almost beats to death the only guy in a jewelry store who open the safe they’re so keen on robbing; then, to make matters worse, the robbers begin fist fighting among themselves! It’s funny, really, until people start dying with bullets through their head and blood soaks the screen. Still, Lam maintains a good sense of timing, infusing the film with a vitality seldom seen in Hong Kong or Hollywood products. The tempo is fast without being hurried or dizzying. Distracting us from the plot and characters, however, is a loud, blasting, bass-heavy musical track that in more than one instance had me reaching for the mute button. Why Lam felt he had to underscore every plot action with the thump, thump, thump of a pounding rock score is beyond me, but if you’re in to loud music, you’ll probably love it. Then there are the stereotypes. I suppose we’ve got to expect them in a film of this kind, but it doesn’t make them any easier to take. The old Inspector is driven to drink by the death of his brother, a fellow cop killed in the line of duty; and he’s driven to distraction by another cop, John Chan (Roy Cheung), that he is assigned to assist. Chan is a youthful, cocky, headstrong know-it-all who, of course, refuses ever to listen to reason. As a consequence, the Inspector and he literally come to blows on two separate occasions, both of which are ludicrous, and no police force would tolerate such actions. So, while the film is ultra-realistic on the one side, it’s unbelievable on the other. And there is the inevitable love interest for Chow, an on-again, off-again romance with a sometimes fiancee (Carrie Ng) who threatens to run away with a millionaire if Chow doesn’t marry her immediately. Finally, we have to contend with the amateurish acting of almost everyone but the principals, the cars that spontaneously explode into gigantic fireballs upon impact, and the English dubbing that in a few rare instances actually matches the speakers’ lip movements. It makes for a frustrating film, one I wanted to like a lot more than I ended up liking. The movie is presented by Buena Vista in a 1.74:1 screen ratio, enhanced for 16×9 televisions. The picture quality is OK but nothing that would sell the movie. Colors are rather limited as much of the action was filmed at night. The picture is dark, mainly, with blacks, blues, and gunmetal grays predominating. There is a slight blurriness about the images, a few age specks to be seen, and a very small amount of grain. The Dolby Digital 5.1 sound, however, fares better. There are some good effects in the rear channels–birds chirping, traffic noises, musical ambiance, cars driving by, gun shots, water running, boats on a river–all accompanied by that super-deep, pumping, rumbling musical bass line I mentioned earlier. As for extras, how about none? Or practically none. English is the only spoken language provided, with English subtitles for the hearing impaired. If I had to watch the film again, I think I’d opt to turn off the sound altogether and just read the subs. Now, why didn’t BV think to offer the option of leaving the original language with English subtitles? Perhaps because they only had available to them the U.S.A. version, as indicated in the credits? (I wonder, too, if the musical soundtrack wasn’t added for the U.S.A. edition?) Like Buena Vista isn’t a big enough outfit to have obtained the Hong Kong version? The only other things on the disc are some “sneak peeks” at other Buena Vista DVD offerings and a measly sixteen scene selections. Oh, and then there’s the oddity of having an opening screen that does nothing but take you to the Main Menu. Why not have just begun with the Main Menu? Who thinks up this stuff? Like John Woo, his contemporary in Hong Kong action thrillers, Ringo Lam has begun to direct English-language pictures. His first two entrants are both with Jean-Claude Van Damme: “The Replicant,” 2001, and “The Monk,” in production as of this writing. It remains to be seen if Lam can maintain the quality of his earlier products. As I said in the beginning, the theme of a jewel robbery gone bad was said to have inspired Tarantino when a few years later he made “Reservoir Dogs” (based on his English phonetic bastardization of the title “Au Revoir, Les Enfants,” the director’s little joke). The now more-famous Tarantino film has its similarities but it’s not entirely a rip-off, Tarantino adding more scintillating dialogue and better supporting players to his effort. But, in fact, “City on Fire” is the better paced of the two. Let it suffice that both are good films and merit attention. I just wish Buena Vista had lavished a little more care on Lam’s film; it deserves better.